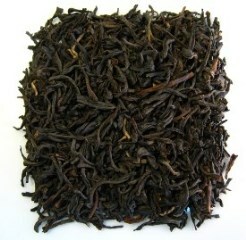 Assam Tea is an Indian black tea that is known for its malty flavor and bright color. 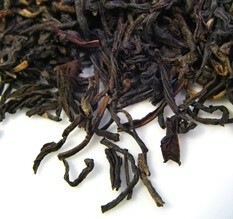 Long twisted dark brown shoots make up the typical appearance of this tea. 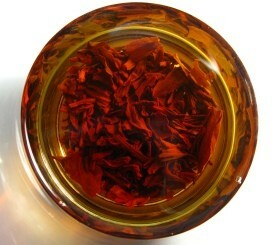 Golden buds with a flowery and spicy odor are blended with the tea leaves. This black tea comes from a different cultivar of the tea plant that grows in this particular tropical region of India by the Brahmaputra River. Full of flavor as well as plenty of health benefits, this is a fitting tea for your morning cup of tea. Shall we find out why? Let’s travel to India and sip a hot cup of tea! Assam tea is a very special black tea because it is harvested from a different tea plant that was discovered to be native to the Indian lowland region of the same name. In China and other places around the world tea comes from the camellia sinensis, while in Assam black tea is harvested from the variety camellia sinensis var. assamica. Even though green and white teas are starting to be produced in Assam, the region continues to be known for its black tea. Perfect tropical conditions of humidity, monsoon rainfall and high temperatures allow for tea gardens to flourish here. Until the 19th century all tea was harvested from the Chinese tea plant; this meant that tea had to be bought from China or tea seeds or plants had to be transported and planted elsewhere, mainly India. In 1823 Robert Bruce, a Scottish adventurer and failed civil servant, explored the Assam region, low in altitude, situated in the northeast of India, east of the famous Darjeeling region in between Bangladesh, Myanmar and China. Robert found the first camellia assamica growing wild in the region. Dying soon after, the task of sending the plant to the botanical gardens of Calcutta for study would fall to his brother Charles. In 1839 the Assam Tea Company was founded and established tea gardens to begin production of this black tea in the Assam valley. Today, this tea is high appreciated around the world and due to its caffeine content it is preferred as a base for breakfast blends: English Breakfast or Irish breakfast. Spring Flush – the first harvest of Assam tea takes place in March, sometimes until mid-May. The leaf is small and the tea is rich in buds. It is quite rare and unknown. This tea is considered delicate and floral with a light colored brew. 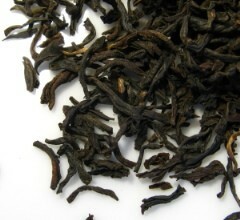 Summer Flush – this second harvest takes place from mid-May onwards and is known as tippy tea due to the golden tips on the leaves. This is a sweeter tea, darker, full-bodied and generally considered the superior harvest. This is a wonderful tea that has brought great respect to Indian teas and as it is a black tea you may reap a great deal of health benefits with every cup you drink. Assam black tea contains vitamins, minerals and antioxidants that are essential for your health and may prove to be quite beneficial when it comes to healing or preventing illness. The mineral and antioxidant content of Assam tea may help boost your immune system and build your defenses. This is why a cup of tea a day may help relieve or even prevent disease. So as soon as you feel the first symptoms of the common cold hitting you, bundle up and make yourself a hot cup of tea, sweetened with honey. With luck you may be able to speed up healing and spend less time sick in bed. Assam tea is like most black teas in the sense that it contains caffeine, a stimulant that may help you stay awake and concentrated throughout the day. On the other hand, tea also contains an amino acid called theanine that relaxes your mind, allowing you to stay alert, but calm. You will be focused and less fatigued at the same time. This tea is also said to stimulate memory and relieve tension to the brain. Although there are no final studies proving this, some believe that regular intake of black tea may lower the risk of Alzheimer’s disease. One of the benefits of black tea is that it may help improve your cardiovascular health. Assam black tea is rich in antioxidants that strengthen your blood vessels and lowers blood pressure. As with other types of tea, this Indian black tea may help to break up bad cholesterol and plaque buildup that could be the cause for heart attacks or stroke. If you have a previous heart condition, talk to your doctor about what type of tea is more appropriate for, as Assam tea contains caffeine. Drinking black tea on a regular basis may greatly improve a sluggish digestion. By increasing the rate at which your body metabolizes food, this may reduce painful feelings of indigestion. With a faster digestion, your body will absorb less fat or sugars from foods, leading to potential weight loss and reduced sugar levels in your blood. Tea should be taken unsweetened to help with weight loss and as Assam black tea has caffeine, it may be used as hydrating energetic beverage when working out. Although the claim that black tea may help to prevent cancer still needs further scientific study, there may be some merit to taking a quick look at this potential health benefit of tea. The antioxidants present in teas like Assam tea may help boost your immune system and also reduce the risk of damage your cells face due to environmental and stress hazards. Less risk of mutation to your cells may mean less risk of tumors and certain forms of cancer. If left unsweetened Assam tea may be fully appreciated for its magnificent flavor and may also aid preventing bacteria and viruses that could harm your teeth or gums. After a meal drink a cup of this tea to help rinse away any food particles that may have stuck in your teeth. This simple act could help prevent cavities or mouth infections. Rich in fluoride, this tea many also strengthen your teeth. Would you like to know more? Learn about the general benefits of black tea that are common to this type of tea. Have a sip of this black tea now! Assam black tea typically has a high level of caffeine and therefore it is recommended that you drink this tea in the morning. Caffeine is a compound that the tea plant stores in the young buds and tips of leaves to protect it from bugs that wish to chew at it. Although other factors also influence the amount of caffeine in any type of tea, this one serves as a guide you can use when buying tea. So if you purchase a tippy tea (with lots of leaf tips) then expect a highly caffeinated tea. If caffeinated beverages keep you awake at night, then you shouldn’t drink this before going to bed. Caffeine sensitivity may lead to insomnia, irritability, headaches and loss of sleep. If you are pregnant or breastfeeding, check with your doctor what are the acceptable levels of caffeine you may ingest on a daily basis, but you should expect to be told not to drink tea. This is a great quality tea that should be brewed properly in order to get the best possible taste from it. Here are some suggestions to start you off on the way to learn how to make Assam Tea. Choose a large porcelain teapot, preferably round in shape so that the tea leaves may swirl freely and open up releasing their full flavor. Preheat your teapot and cups by filling them with hot water which is discarded as when you feel the surface of your teapot become warm. Place in your heated teapot 1 teaspoon of Assam loose tea leaves per cup of water (250ml). If you wish to drink a stronger tea, then add more tea leaves per cup. Use good quality water when brewing your tea. As a rule of thumb: if your regular tap water is not enough for you to drink, then it is not good enough for making tea. Bring water to boiling point, you may even let it cool a bit down to 95ºC (203ºF). As these are black tea leaves there is a lower risk of ruining the tea by using boiling water than with other types of tea. Pour the water over the tea leaves and let your tea steep for 3-5 minutes. If you wish a milder tea than reduce brewing time. Long brewing periods may render your tea bitter and astringent, but since this is a matter of taste, adjust steeping time to your liking. Serve your tea in white tea cups and observe its bright coppery color. 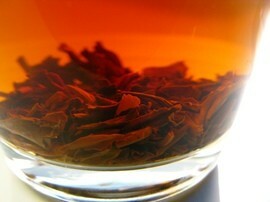 Now smell your freshly brewed Assam tea and feel its aroma of pungent autumn spices and fruits. When you drink this tea plain you will taste its malty, vigorous and astringent flavor. A spring harvest tea will be sweeter and more flowery than a summer harvest tea which is fruitier. You may add sugar or honey to sweeten your tea and this bold tea can take a bit of milk if you like. Be careful when adding milk so as not to cool down the tea too much. You may go even further and use Assam tea as the base for making your own Chai tea. You just need milk and some spices. Check out the recipe here. Remember that if you want to brew your tea leaves a second or third time you should strain your tea completely when brewed and then increase steeping times for the following brews. This is a unique tea with a great flavor and strong character that it is sold both on its own as well as in famous breakfast blends such as Irish breakfast. Therefore Assam tea is best enjoyed in the morning. Buy Your Assam Tea Today! Click on image or on the link below to purchase your Assam tea from Palais des Thés (US). There is a selection of Assam teas on offer: Assam Maijian, Assam Hattiali, Assam Bazaloni. Maijian and Hattiali are harvested in the summer resulting in full-bodied teas with strong spicy aromas and flavors. These are strong teas best enjoyed in the morning and each will only take about 3 to 5 minutes to brew in water heated to 90ºC/194ºF. 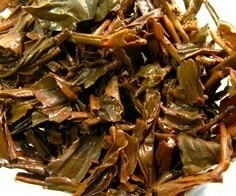 These are high quality large leaf teas with golden tips and buds, offering an amber to dark liquid for you to drink. Buy your Assam teas here! Beautiful and golden, this is a healthy cup of authentic Indian black tea. Try it and enjoy a wonderful tea. May this be the black tea for you!